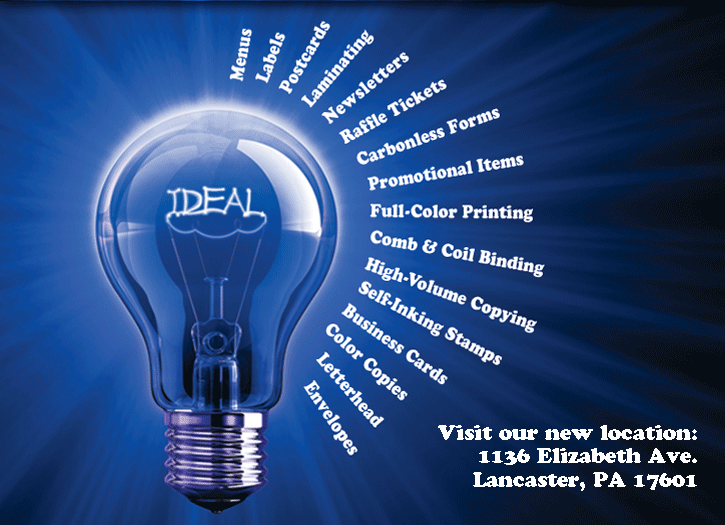 Ideal Printing, a family-owned and operated company, is proud to be one of Central PA’s printing companies. With competitive pricing, Ideal Printing believes in quality, excellent service, and one-on-one customer interaction. We want you to be delighted with our printing and our expert service. If you are not 100% satisfied, we make it right. Without you, there is no us! We take pride in producing outstanding work and customer satisfaction. Printing companies, like Your Ideal Printer are in this business for you and your printing needs. Come, let us help you because every job is important to us. To email us just click here or call 717-299-2643. Your Ideal Printer is one of the best printing companies that provides printing services in the Philadelphia, Maryland, Washington DC and NJ areas.